Hi it's Sandy wishing everyone who celebrates a very happy 4th of July. 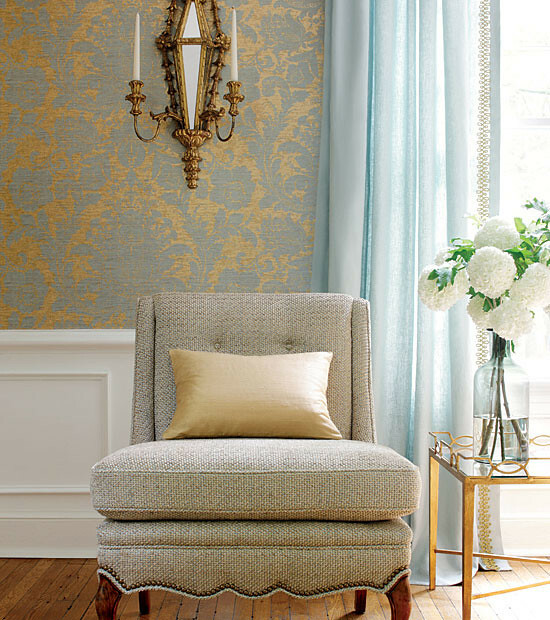 For this Be Inspired post I'm sharing a layout inspired by home décor, in particular, the look of vintage wallpaper above wainscoting panels. Here's my inspiration photo. I use the same colours of blue, green and kraft on my page. Instead of the gold highlights I substitute a muted red in the form of the scallop pattern. 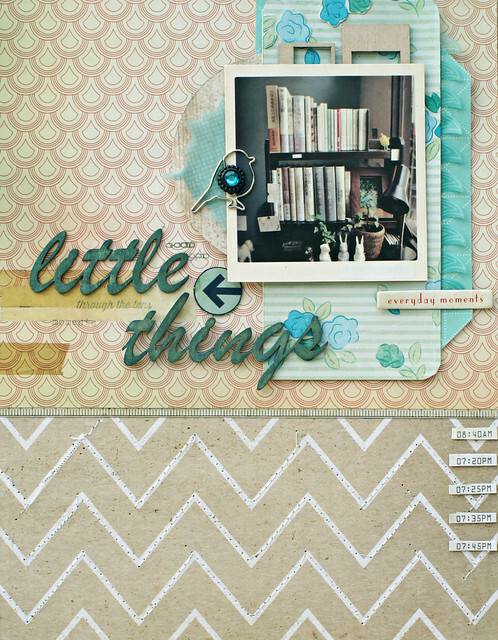 Keeping in mind the theme of retro vintage makes it easy to mix papers from the various kits this month. 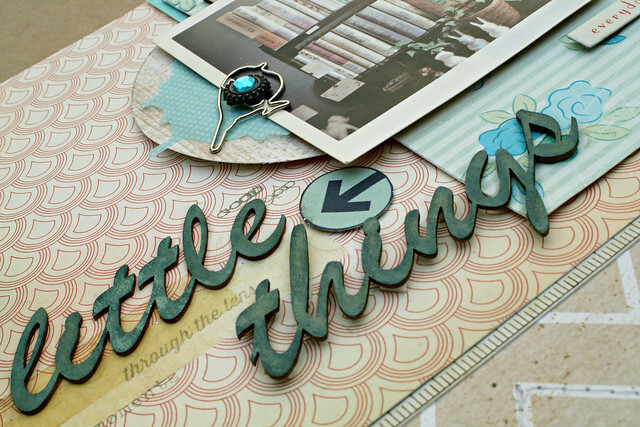 My favourite elements on this page are the vellum die-cuts. The waves floating above a matching blue diamond pattern makes an airy ruffle border while the map of America is turned on it's side to become a sort of ink splatter on the left. I love the little embellishments Trina includes in the kits such as this bird paperclip and rhinestone brad. The only things I added from my stash are these chipboard words and the 'through the lens' stamp which comes from a previous Citrus Twist kit. Everything else comes from the July Main, Embellie Kit, Add-On Kit and Pattern Paper Kits. Be sure to leave a comment with your guesses about the July kit contents to be entered for the chance to win a $5 gift certificate to the Citrus Twist shop! Loving the design, colors and patterns here Sandy! This page has a great homey feel to it! This is so pretty and soft. I love it. This is so pretty! I love your inspiration photo. That paper is from Crate Paper The Pier. Thanks everyone. Yes Ashley I did use several lovely papers from The Pier. 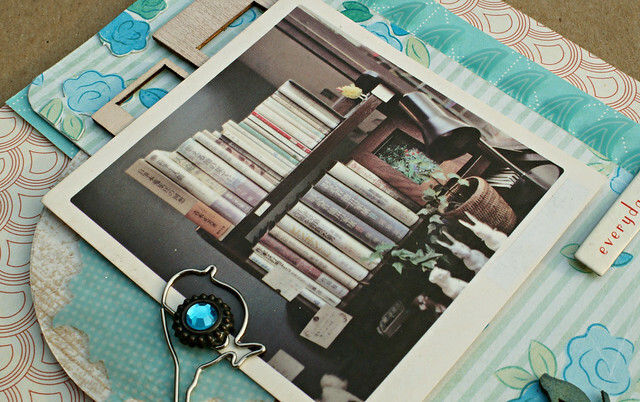 Love the Polaroid frame from Maya Road! those little veneer frames are fun to use Heather. i flipped them round to the back as i just wanted the shapes and not the patterns. Sandy, this is truly beautiful and so classic looking. Love it!